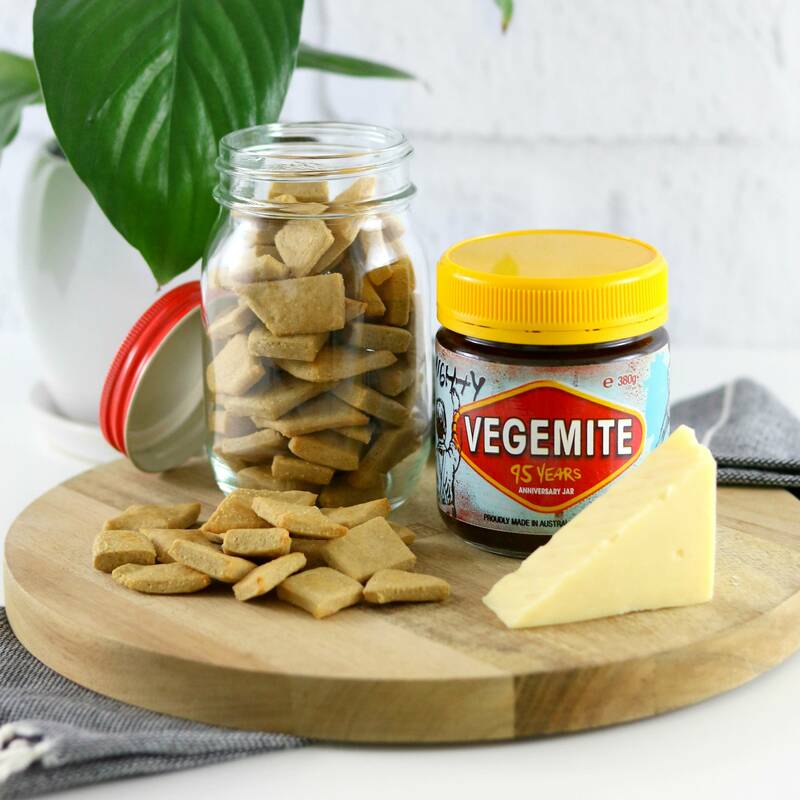 Wishing you could eat the new Arnott’s Vegemite and Cheese Shapes? You don’t have to wish any longer. This Homemade Gluten Free Cheesymite Crackers Copycat Recipe is so easy to make and so delicious to eat. Gluten free, egg free, sugar free, clean eating friendly and seriously delicious - with a vegan option too! An Aussie fave that's perfect for Australia Day! Sometimes I don’t know what would be harder, never eating gluten or eating gluten for years and then never again. For me, I ate gluten for 19 years before finding out I had coeliac disease - so I know what all the delicious gluten-filled foods taste like, but I can never eat them again. 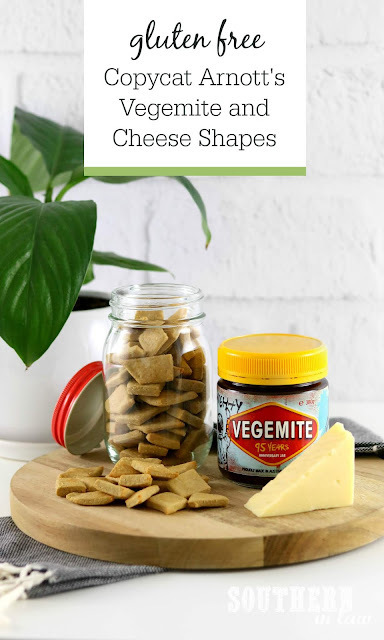 Usually that doesn’t bother me, but sometimes new food products come out that I wish I could eat - and that’s exactly what happened when Arnott’s released their new Vegemite and Cheese Shapes. When Jesse bought a packet of the shapes and raved about them, I sprung into action... on a mission to create my own version.... and somehow I nailed the copycat version! Jesse decided these tasted exactly like the gluten-filled version and they were so easy to make. Better still? They’re free of questionable ingredients, egg free and made in minutes. Perfect for snacking, School lunchboxes or get-togethers with friends. They’re best eaten fresh so they’re super crunchy, but if you roll them out really thin (not thicker like the photos - they have softer centres and crunchy edges), they’ll stay fresh for 2-3 days at room temperature. Oh and if you're worried, don't be! This recipe doesn't use actual Vegemite (which is not gluten free!) - so you're safe! 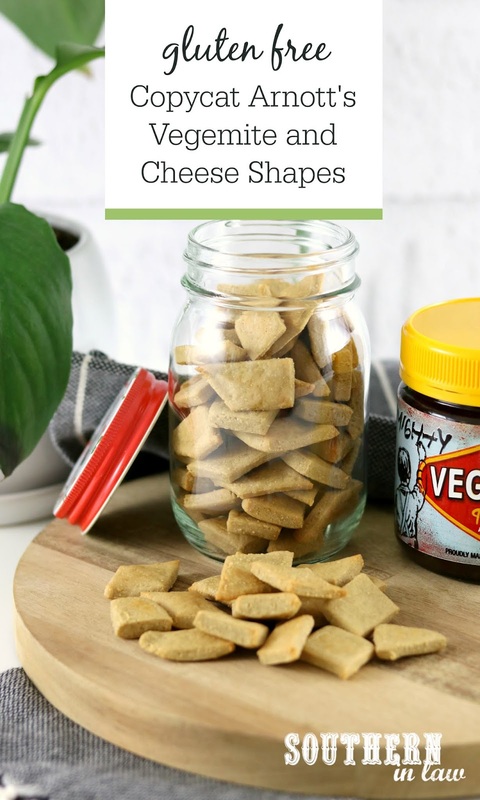 Wishing you could eat the new Arnott’s Vegemite and Cheese Shapes? You don’t have to wish any longer. This Homemade Gluten Free Cheesymite Crackers Copycat Recipe is so easy to make and so delicious to eat. Gluten free, egg free, sugar free, clean eating friendly and seriously delicious - with a vegan option too! An Aussie fave that's perfect for Australia Day! Click to pin this recipe on Pinterest! Add your Vegemite alternative and pulse until your mix resembles breadcrumbs. Roll out one half of your dough ball between two pieces of baking paper, rolling out the dough until it's about 2mm thick. The thinner you roll them, the crunchier your crackers will be. Slice your crackers with a sharp knife and place your crackers onto your prepared baking sheet, leaving a little bit of space between each cracker. Repeat the above process with your remaining dough. Bake for 7-10 minutes or until crunchy and lightly golden. Baking times will vary depending on the thickness of your dough so keep an eye on them and take them out once they're golden. You can also make these vegan by using vegan cheese. Is there a particular food you wish you could eat but can't because of allergies/living in a different country/etc? I wish I could go to a Yum Cha restaurant and eat alllll the steamed dumplings... but I think I'll have to learn how to make them myself since I don't know of any gluten free yum cha restaurants! That's my next recipe testing mission!